Mostly found in the east side of the Rocky Mountains in the United States, the American dog tick is a notorious dog pest. They are not limited to that area though for some are said to exist in other parts of America (California, the west of the Sierra Nevada Mountains, the Pacific northwest and west of the Cascade) and in some parts of Canada and north of Mexico. They inhabit wooded areas and grasslands and other shrubby areas where there are available hosts. However, in the scarcity of blood meal, they venture along trails, roadsides and any area with grass in search of potential hosts. This tick type would live on blood of smaller mammals during its first 2 stages in its 3-stage life cycle. During its larval and nymphal stages, it would feed on small animals but would seek out larger hosts other than dogs upon reaching adult stage. Scientifically called dermacentor variabilis, this tick has 6 legs during its larva stage and develops 2 more upon reaching nymph stage. While at these young stages, this tick has a distinct red mark near the eyes. The adult American dog tick has 8 legs. They are typically brown in color; some are red-brown. Their back is covered with a dorsal shield called scutum which is marked with silver-gray pattern. The female’s scutum is slightly smaller than that of the male’s. Adult females are about 5mm; males around 3.6mm long. An engorged female can grow up to 15mm long. Only adult dog ticks possess genital openings. The parts of its mouth and its base called the capitulum may be seen when looking at the tick from top view. In each stage of the tick, blood meal plays an essential part so that it can progress to the next, each stage using a different host. The cycle may be as short as 54 days but in the absence of a host at whatever stage or changes in the environment, the cycle may take up to 2 years to complete. A fully engorged female dog tick detaches itself from its host from whom it has fed around 5 days to 2 weeks. She hides somewhere for about 10 days and uses the nourishment to develop her eggs which when laid numbers to thousands. The eggs of the American dog tick may take up to 40 days to hatch into larvae. The larvae would sit around or hold on to some vegetation questing for a potential host. Even without feeding they can last up to 11 months but once a host is found, they would feed for about 2 weeks then again detach from their host, awaiting their next stage, nymph, on the ground. As nymphs, they again seek another host from which they would feed over a period of 3 to 10 days but questing could take up to 6 months and they are able to survive that. After the required feeding, they once again fall to the ground to molt into an adult tick somewhere from 21 days to a few months depending on environmental circumstances. During the winter season, the adult American dog tick stays dormant on the ground and becomes active by the middle of April through early September. In general, it is the months of March up until July is the time when larvae are active; June to early September for the nymphs. This may vary though depending on the certain locations. 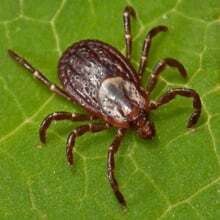 There were also some studies that observed some activities in adult ticks even while overwintering. There are available products in the market that effectively prevent an infestation of the dermacentor variabilis. That said, see that your dogs don’t become victims and play hosts to these pests so that your dogs, you and your family members can avoid tick-borne diseases.